THE B-MOVIE NEWS VAULT: SAN DIEGO COMIC-CON HIGHLIGHTS: ZOMBIES, DEADITES, WOOKIIES, & MORE! SAN DIEGO COMIC-CON HIGHLIGHTS: ZOMBIES, DEADITES, WOOKIIES, & MORE! Every year, I get super excited for San Diego Comic-Con (henceforth referred to as SDCC) because there are typically tons of cool announcements from the world of comics, film, toys, and television. And this year is no exception. I've been on an emotional rollercoaster for the past twenty-four hours with all the cool news that have been streaming/leaking onto the web from the event. Come with me on this journey, as I highlight some of, what I consider to be, the biggest announcements thus far. THE TRAILER FOR "ASH VS. EVIL DEAD"
Oh. My. GOD! I was on the fence about the show, even after seen pics of Bruce Campbell with his trademark Deadite-battling weaponry. But any trepidation I had about this show is gone after watching the gory, and hilarious trailer for Starz' upcoming TV series based off of Sam Raimi's beloved EVIL DEAD trilogy. Scope out the trailer below and get excited for ASH VS. EVIL DEAD's premiere on All Hallow's Eve this Fall! THE TRAILER FOR "FEAR THE WALKING DEAD"
AMC's "prequel" to THE WALKING DEAD, follows a new cast of characters who struggle to survive the beginning of the zombie apocalypse. It looks surprisingly good and premieres on AMC on August 23rd, to hold us WALKING DEAD fans over until Season 6 of America's favorite zombie Drama rears its rotting head in October. Peep the trailer below! THE TRAILER FOR SEASON 6 OF "THE WALKING DEAD"
This is looking intense. Rick Grimes and company seemed to be taking over their new home at the end of Season 5, but things apparently aren't going as planned if the Season 6 trailer is any indication. Hordes of zombies, unrest & dissent amongst Rick's group and the people they are trying to protect, and possibly a new villain are teased in this first look at the new season, which premieres on October 11th on AMC! There are few movies left this year that I am as excited for as the newest entry into the STAR WARS saga. The two trailers that have been released thus far were tantalizing teasers, and now we've gotten a delightful appetizer to go with them. This behind the scenes footage from the sets and shooting locations of STAR WARS: THE FORCE AWAKENS, shows that a good chunk of practical f/x was used. And some of it is so awesome, that I nearly wept with joy. No really. It gave me the same emotional reaction that I had to the previous teaser trailer. The more I see of this film, the more I'm certain that it will be the greatest thing EVER! (Until the other sequels and spin-offs come out that is.) Watch the footage for yourself and keep some Kleenex on hand! 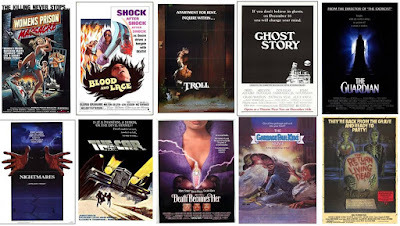 It's common knowledge that I am a huge Scream Factory (and Shout! Factory) junkie. So when I heard that they were announcing TEN new titles to their horror catalog, I waited with bated breath to see what they had planned. I was not disappointed. CLICK IMAGE FOR A CLOSER VIEW! HO-LEE SCHNIKES! LOOK AT THAT! LOOK AT IT! I guess I can kiss my savings account goodbye now! 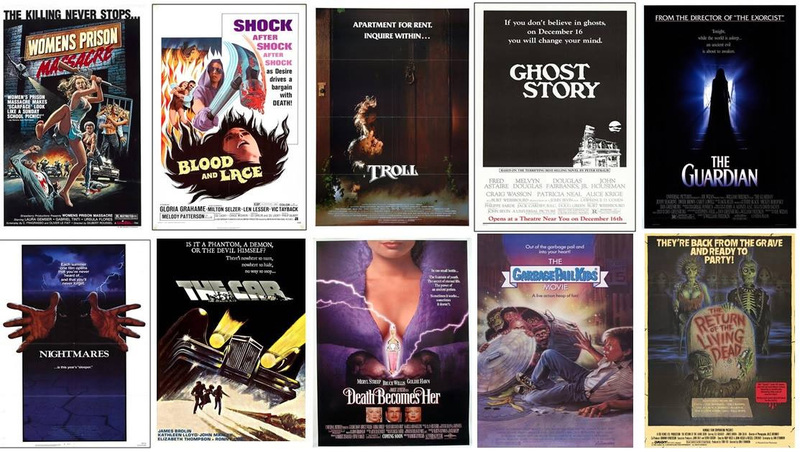 I haven't seen WOMEN'S PRISON MASSACRE, BLOOD AND LACE, NIGHTMARES, or THE GUARDIAN, so I'm excited for those, but I'm really psyched for TROLL (which will be paired with TROLL 2), GHOST STORY, THE CAR, and DEATH BECOMES HER. I already own RETURN OF THE LIVING DEAD, but I'll prob double dip because the Scream Factory release will probably blow the current MGM Blu-ray out of the water. And I'll most likely pick up THE GARBAGE PAIL KIDS movie because I am a glutton for punishment. I know it's awful, but dammit, it was a staple of my twisted childhood and I must have it! The con is still going strong as I type all of this, so don't be surprised if I make yet another post featuring more news and updates from the SDCC. Regardless, GET PUMPED because the final quarter of 2015 is shaping up to be AMAZING! Did they say if ROTLD will have the original soundtrack intact? No info as of yet. They merely announced that it would be part of their upcoming release slate. I didn't realize that there were issues with the soundtrack. Yep. There certainly was. 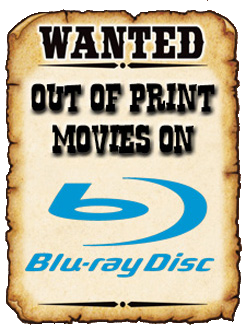 At least in the U.S., The original DVD and current Blu-Ray had their soundtracks edited. The Second Sight DVD and Blu-Ray in the United Kingdom has the original soundtract intact, though.